Earning his MFA in Glass, Bob opened his first glass studio in 1979 and is now operating his studio in Asheville, North Carolina. To this day he finds it is an exciting challenge to combine the varying factors of hot glass, light, color, form, and transparency into each finished piece. Bob’s interest in art glass began in 1971 as he began working with stained glass while enlisted in the Navy. Later, while doing independent study in an undergraduate ceramics program, he convinced the instructor to allow him to explore glassblowing in 1975. Earning his BFA in Ceramics in 1976. His work is directed toward using internal designs of air inclusions and laminations of unique optical coatings. His pursuits have led to the design of the first blown art glass kaleidoscopes. In design collaboration with his wife Margaret, Bob has adapted the process of applying his own uniquely patterned high-tech optical filter coatings, ‘DICHROICS’ onto the surfaces and interiors of three dimensional blown, carved and laminated glass sculptures. The high-tech optical coatings used produce dramatic kinetic color shifts which actively involve the viewer with the work. 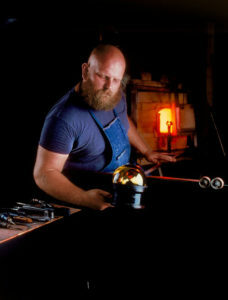 1992 Established His Glassworks Coldworking Tools and Supplies for artists and educational studios internationally. I believe in truth, facts, and objectivity. In the 20th century some fashionable philosophers took a turn toward incoherence — contending that objective truth and reality, if they even exist, are always relative and ultimately unknowable (or ultimately different for different people). We reject this. Facts are stubborn things, rebuking the elaborate wordplay of sophists with their palpable solidity. No one who ever swung a hammer thought it a mere logical construct at the moment he smashed his thumb. I believe in right reason. Reason is a razor — cleaving truth from falsehood and fact from fiction. Reason has given to mankind the blessings of science and medicine, engineering, technology and the arts. It is the foundation upon which civilization is built. I believe in moral absolutes. Just as there are physical laws that cannot be ignored without grievous consequence, there are universal moral laws as well. Among them: Every individual is born with intrinsic moral worth and dignity no greater or no less than another’s. Nothing can change that except an individual’s own behavior. Each individual is an end in himself — never a mere means to an end for others. I believe in freedom — in liberty, the ultimate cause. As the Founders stated in the Declaration of Independence, all men are endowed by their Creator with certain unalienable rights — among them life, liberty, and the pursuit of happiness. Individuals have the right to self-determination: to do as they wish, up to the point at which they infringe on the rights of another. Government’s primary purpose is to protect individual rights against aggression; that is why individuals cede to government a monopoly on the legitimate initiation of force, though they always retain the right to use force in self-defense. I believe in the right to property. I believe in free enterprise. There is no such thing as the capitalist “system” — capitalism is but the sum of the economic interactions occurring naturally among individuals who are free to pursue their own prosperity. A system of laws and regulations is necessary to safeguard the innocent from the depredations of the wicked, but government should not interfere in the free and honest exchange of goods and services. I believe in man’s fallen nature. Any institution of man will be fallible; great plans always entail unintended consequences. For that reason, governments ought to undertake major endeavors rarely, and then only with exquisite care. The history of the 20th century has demonstrated that Utopian schemes, usually undertaken in the name of collectivities, lead inevitably to jackboots grinding the human face. Because all persons are equally free and emphatically are not merely the means to another’s end, each individual bears the responsibility for the choices he or she freely makes. I believe in limited government. Because it relies at bottom on the threat of coercion, government should perform only those functions society cannot perform through any other means. I believe in a strong national defense. Before a people can set the course of their country, they must secure its autonomy from outside predation. That is the chief purpose of the national government. I believe in fiscal conservatism. Because taxes confiscate the labor of the people, public officials have a solemn responsibility not to waste the proceeds on frivolous or foolish programs or projects. Taxation itself is not theft, but incontinent prodigality with the proceeds of the taxpayers’ labor is. unswerving devotion to ethical principles. I believe in innovation and progress. Innovation — the wellspring of progress — and sustained effort can produce lasting improvement in the lives of men and nations. At its best, tradition is not a blind adherence to ritual and cant, but a clear-eyed recognition that history’s mistakes offer useful lessons. Practices of long standing have passed a test of time, and should not be lightly cast aside. The rules of aesthetics may be less apprehensible by reason than the laws of physics, but they are no less true. Some might have roots in evolutionary psychology — e.g., a preference for smooth surfaces that reflects an aversion to pockmarks indicating disease. Harmony, grace, and order contribute to aesthetic appeal: Abiding works of music, art, and architecture incorporate them. Individuals have the right to self-determination, but they can find self-fulfillment only through the deep connections of relationships with family, friends, neighborhoods, social groups, and fellowships. * These are the things I believe in, the things I trust in and the things that drive me every morning to open my studio and conduct it with the utmost fairness and respect to my collectors and the appreciation of my chosen medium. It is with these principles in mind that I honor you and will attempt to exceed your needs in every way possible.